We have with us Kamla Kapur, the author of the lovely book The Singing Guru!!! I’m so glad to have caught her for an interview on our blog! When I was eleven years old we returned from a family holiday and my father asked me to write about it. That’s how I got started. My first poem was a poem to my journal. My father had always wanted to be a writer, too, and did a lot of it after he retired from the army. A penny for your thoughts on Spirituality? I believe that we have much to learn about this from the Masters. On the turbulent journey of life one often needs guidance. The word ‘guru’ means ‘dispeller of darkness.’ Every tradition has its guides. The prophets of all religions function as gurus who teach us how to live, what to think, how to behave with others. A guide is anyone who has traversed the path before us, knows the terrain, knows where the pitfalls are, can see further than we can, and knows the best course of action in conflicted and confused times. A guide does not want to harm us by constricting or limiting our potential, by setting us apart from others. We can, after we have tried them for their worth on the touchstone of love, trust them. Guidance can come to us from any source, any place, any person, if we supplicate and pray for it. It is never withheld. What are your views on the current religious tensions all over the world? It is very tragic that humans can be so blind and foolish. Water is water whether you call it water, aqua, l’eau, pani, jal or any of the names for it we have in all the cultures of the world. But we fight with each other because our name for water does not jive with others. The Energy and Power we call God, Allah, Bhagwan, rab, Vishnu etc, etc, is One. Guru Nanak’s definition of a religious person is “one who looks on all as equal.” Brotherhood and sisterhood of all on this planet is Sikhism’s basic tenet. I can only surmise that there is so much conflict because there is a deep necessity for violence in our nature. I am not justifying it, but pervasive it is does make you stop and think. You have to take a metaview of these unending phenomena of tension, conflict, war. If the Energy is One, then Creation and Destruction are two aspects of it. In the West these two are polarized but not so in the East. 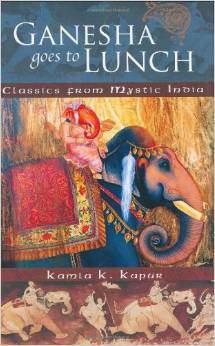 There is a wonderful story from the Indian tradition, from the Mahabharat, in fact, that I have recreated in my book, GANESHA GOES TO LUNCH, called ‘See Him in the Dark,’ on this topic. And then there is also the possibility that as we evolve as a species and live up to our name of homo sapiens sapiens, it will decrease. This is certainly my hope. 4. What message do you have for your readers? The message is interwoven in my books. I prefer to give my message through a story rather than prose. 5. How has your publishing journey been? Difficult, conflicted, the source of much suffering in my life. In retrospect I can see that it all came from wanting too much too soon. The ego gets all entangled in the fruits of your action instead of the action itself (in this case, writing) and takes you through a hellish journey. But I am at peace now. I just do the work. I am pleased my books have found their audience, even if its just a handful of people. How important is it for indie authors to rely on good quality editors and beta readers? It depends on how long you have been writing for and how careful you are in your writing. Writing is at least 50% rewriting and constant revision. If you are the kind of writer that is not content with any sentence, paragraph, image, dialogue, or any part of the plot, of if a character seems unintentionally insincere, and keeps working at it till it satisfies, then the need for an editor is far less than if you write in a hurry and are in a toot to get it published. I have always slightly resented editors, although I have benefited from others as well. In general, it is always good to get a second opinion because you can get so caught up in your work as to lose perspective. I believe that Time is the greatest editor of all. If you let something sit for a while you automatically get distance from it and can go back to it with a new, more objective eye. This is one reason why I work on several books at the same time, moving from one to the other after a lapse of time. The book I am completing now, MALINI IN WHIRLWOOD, has been in the making for 40 years! Yes, yes, I know how weird that must sound to young writers in a hurry to get published. I don’t know what you mean by ‘beta’ readers. Do tell me! Here is an interview question for you! I am finishing up Malini in Whirwood, which is the first part of a trilogy; I am half way through the second book in The Sikh Saga Series, The Dancing Guru. I hope to complete the series by the end of my life, if the Universe so wills. There are at least five more volumes in it. Thank you so much Kamla, for taking the time out to spread such lovely wisdom through this interview!!! 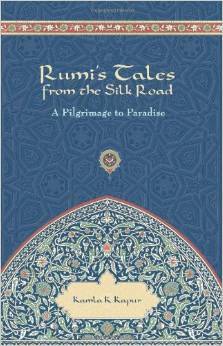 From the best-selling author of Ganesha Goes to Lunch and Rumi’s Tales from the Silk Road comes an original novel about the life and travels of Guru Nanak, a musician, enlightened thinker, and one of the most beloved figures in eastern spirituality. 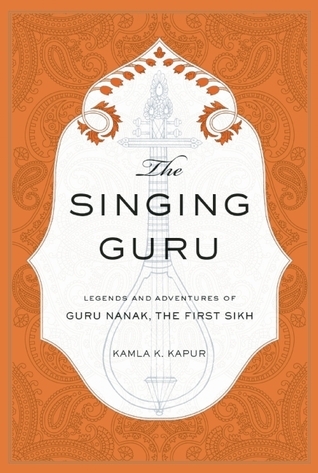 In this fascinating book, Kamla K. Kapur weaves together facts, legends, folktales, myths, and over forty of Guru Nanak’s poems—preserved in the Sikh holy book, the Granth Sahib—to form this captivating depiction of the leader’s life. From being seduced by deadly women to almost getting eaten by cannibals, the exciting account presented in The Singing Guru includes moral tales without being proselytizing. Factual details are intermingled with fantasy to produce a symbolic portrait in which humor and imagination combine to convey a profound and entertaining spiritual narrative. I’ve not known much of Sikhism beyond what was taught in school and I’ve always wondered about that faith and religion. I have always known followers of Guru Nanak to be extremely peaceful and embracing of other religions as well as nurturing a strong pride for their own. And I’ve found it admirable. This book was such an eye opener. Firstly, it is told from the point of view of Mardana. Who is a muslim following Baba Nanak across his spiritual journey. This book is extremely simple to read. It is also power packed with gems. You want to find out what happens. Mardana is a brilliant narrator and you get lost in his stories. He silently goes about peeling layer over layer from your eyes as he makes you want to embrace a simple and wholesome life. Indeed the allure of a simple life is very strong. When you’re caught in the never ending cycle of work, money, stress and keeping up appearances, it is but natural that your mind and soul will get depleted. Somehow, reading such simple books reminds me that there is more to life than a mere desk job. There is more to life than prestige defined by someone sitting miles away from you. And that glamour need not mean that life is fulfilling. And that the grass is always greener on the other side. This was such a sweet and simple book to read. I will no doubt be reading it again. It demystified one of India’s frontier religions and made me ever so respectful of the followers of this religion. I will be sure to go to a Gurudwara sometime and pray for my soul to find contentment.